Finished hubby’s top today. It took ten days, which is absolutely amazing, until you realise it was chunky/bulky yarn, on big needles. He’s very pleased indeed, and so am I. I sewed it up at the Sip & Stitch today, to general acclaim. 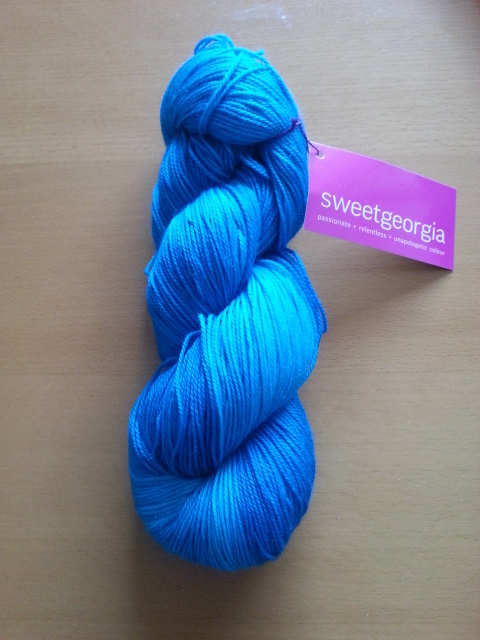 Next up – Sweet Georgia yarn, wound off skeins into cakes, and ready to knit. Red one first, and this is what I’m going to do with it. I’ll cast on tonight. I’m very, very excited. The yarn is absolutely beautiful, really saturated with colour, and very, very soft. The red yarn is called “Tough Love Sock” but is much too nice to knit socks with. The actual colour is much more of a deep red than the pink in the photo. The turquoise is called CashLuxe Fine and is even nicer. 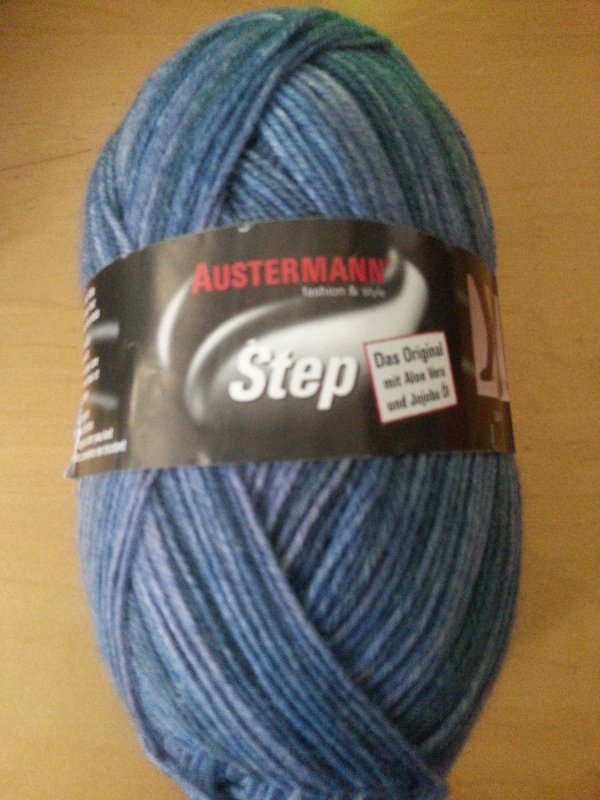 This is what I’m planning to knit with that. It’s also much more turquoise than the blue it looks like. But after the “Glam Shells” I’m going to knit a pair of socks for hubby and see how that goes. Lots of projects in my head, lots of ideas, lots of lovely yarn in my stash. The weather is much cooler now, although still sunny. There’s an autumnal feel to the air. I love autumn, it’s always been my favourite season. I need to do some gardening soon – planting daffodils and annual poppies, digging up the aquilegias which have gone absolutely bonkers, but will wait until I have a bit more energy, the daffodil bulbs, and the time. Time for another blog. I can’t believe it’s so long since the last one. The pain in my right hand is much less now. I’ve weaned myself off Tramadol without any withdrawal symptoms, and today is the first day since I can’t remember when without needing any painkillers at all. I’ve been taking the glucosamine and cod liver oil tablets for a couple of weeks now, and the difference is remarkable. No grinding, even, when I flex the knuckle. It still cracks, though, sometimes, and that hurts, but I can cope with that. Saw the neurosurgeon on Thursday morning. He’s Italian, tall, handsome, very efficient and thorough. The good news is I don’t have Parkinson’s Disease, just “essential tremor” which is age-related. There are tablets which can help, but in my case it’s mild and intermittent, so we’re not going to bother. He asked me to book myself in for an MRI scan of my head and ears – and the hospital phoned today – two days after my appointment with him – because they had a cancellation! Amazing service. So I’ve had the scan, and the results will go to my GP, whom I need to see in three weeks or so anyway. Win. Knitting – all going well. Have knitted the daughter a pair of socks, which she says are like “heaven” on her feet, am wearing the merino wool socks I knitted for myself in the yarn I’m testing to see if I can wear wool without itching, and have even persuaded the husband to let me knit him a pair of socks which bridge the gap between boring (his choice) and interesting (my preference). We shall see. I’ll start on his socks when I get the right size Hiya Hiya circular needles. 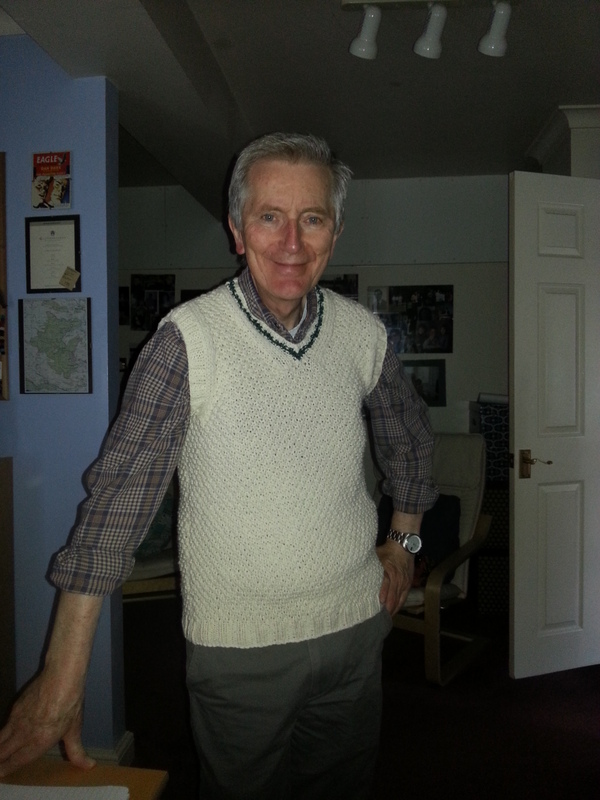 Meantime I’m knitting him a cream coloured v-neck slipover in chunky yarn, which is growing very quickly. I’ve re-painted one wall in our bedroom, which had scuff marks from the old portable fat screen tv set, and it looks wonderful. I used to have a large plant in front of the scuffs, but now have a little plant, and the whole room looks much bigger and cleaner. 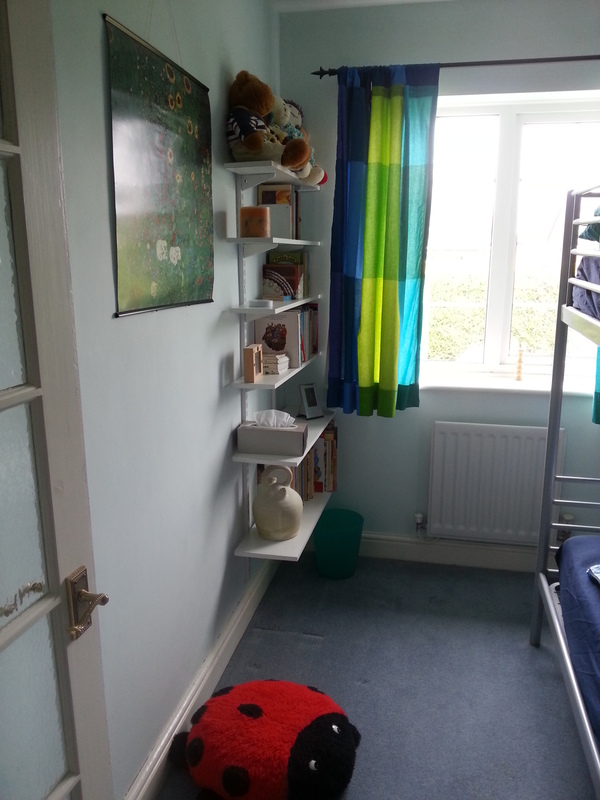 It sparked off hubby’s fixing of wall shelves in our bedroom, and in the children’s spare room, which look much better than the floor standing bookcases we had, and allows for cleaning round and underneath much more easily. The rooms look more open and much nicer. Mugginess gradually decreasing, although still plenty warm enough for summer clothes. The cat is very keen on catching and eating butterflies. Not such good news for the butterflies, but it keeps her very fit. Went to the hospital this week and saw the orthopaedic surgeon about my arthritic knuckles. Apparently the X-ray was “fine” so they’re not going to do anything. I was very disappointed at the time, but have recovered since then and have decided I’ll ask the GP if physiotherapy would help. Meantime I’ve ordered some cod liver oil and glucosamine tablets to see if that helps. The pain is pretty bad, and each time I straighten or bend the finger I can feel the bones grinding. Mm. The new computer arrived, and is set up, and working fine. Couldn’t wipe the old hard drives though because the old pc kept shutting down. So hubby sorted them out with a chisel and a hammer, and now they’re unusable. Freecycled the old pc case full of motherboard, memory, power supply, etc, to somebody who might well get it working, and the monitor stand. Love Freecycle. Have had a large sort out of my yarn stash, and am feeling pretty virtuous. There is a Women’s Refuge which needs yarn so it’s going there. Excellent. The socks are going well. Hoping to try one on younger daughter tomorrow, then I can finish them off. Had a back episode about a week after the M.E. crash. It lasted five days, but the osteopath sorted me out. Still not quite back to normal, but much, much better. Have just read a book called “Stoner” by J Williams. It’s absolutely unputdownable. I read it in a day – I was at the hospital for three hours, so had plenty of time to sit and read it. It’s wonderful. I don’t know anybody who’s read it who doesn’t think so. Highly recommended. Went to Sip & Stitch today (the knitting group at the local yarn shop) and had a wonderful time, sitting, knitting, drinking tea and chatting. And eating biscuits of course. Am just about to go and make tea. Smoked salmon, beef tomato and salad. And baked potato for hubby. Well, it’s cooled down considerably, but is still muggy. Plenty of rain and thunderstorms, so the garden still looks ok, and the lawn is starting to green up a little. I have various strategies for staying cool. One I described in a recent blog (pyjamas all day), another is having a fan on wherever I am sitting, and I don’t use my hairdryer. I spike my (moussed) hair up and leave it to dry naturally. It looks a little odd but I don’t care. It’s cool. Recently bought two summer dresses, one full length, and one with a “dipped” hem. I love them both, and have worn one already, to general acclaim. Also two new pairs of summer trousers, one combats and the other in exactly the same style, but plain dark blue. Both 100% cotton. Re-hemmed them (I always have to re-hem trousers, always) and they look and feel excellent. Perfect for when it’s pouring with rain, as I don’t have any summer shoes except Birkenstocks, which aren’t particularly good in the rain. So I wear my trainers with summer trousers. 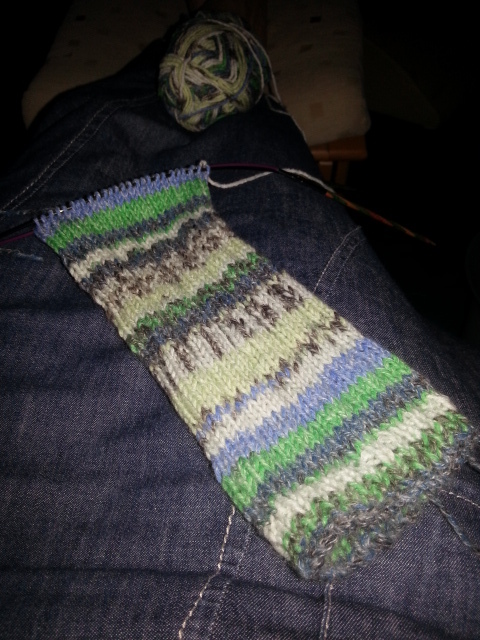 Knitting – progress. 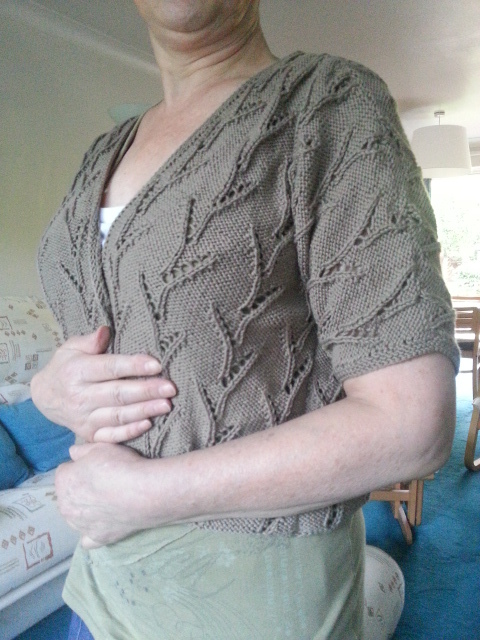 Finally managed to finish off the Cardigan of Doom. It’s currently blocking, and I need to sew on a button yet (it’s a wooden button I chose, so didn’t want to wash it with the button on). 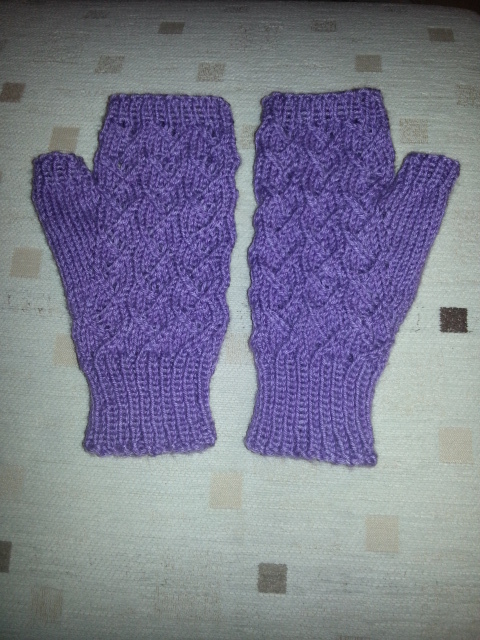 Also finished a pair of fingerless gloves, knitted in the round. 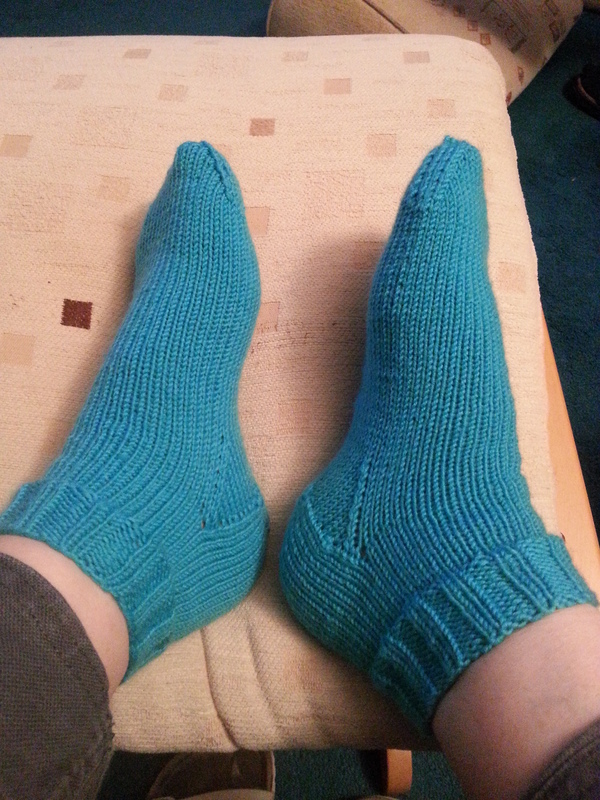 I knitted a pair last year, but flat, so had to re-write the whole pattern, as it involved pattern on every row. Makes much more sense knitted in the round. 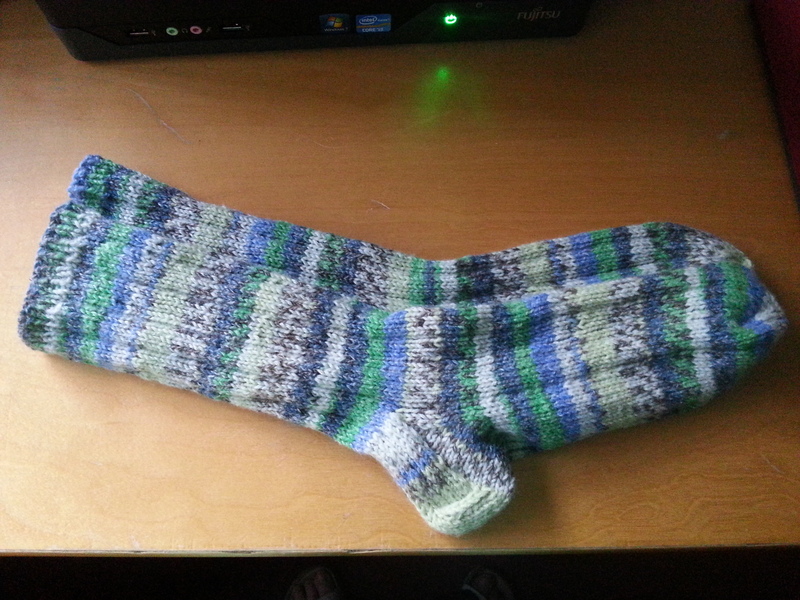 Now started on a pair of socks for YD. I’ve done the leg, am going to turn the heel tonight, and am awaiting the measurements of her feet before I do the foot part, because I’d like them to fit right. In other news, I am typing this on my trusty old laptop, with Lubuntu installed. I had a new computer a couple of months ago, but hubby needed Windows 7 for a particular music-related piece of software, so he has that one, and I have his old one with my old 1 Tb hard drive. So that one has died now. I had thought it might, as it’s about the same age as the one that died recently. But it’s never convenient, is it. Fortunately I’d just backed everything up onto the network, so I’ve ordered another computer (exactly the same as hubby’s), and with a new monitor this time. i always seem to end up with the handed-down monitor, and I thought it was time I had a new one. Still less than £500 though, from Dabs.com. It’s coming this week, and I’ll have it set up by the weekend. Mixed feelings about it. Didn’t really want to have to spend the money, but am perversely excited about new stuff. Windows 7 – can’t bear the thought of Windows 8, because that’s really intended for touch screen stuff. No, no, no, no thank you. Will use Libre Office on it – recently tried to upgrade Open Office to version 4 and it kept crashing my spreadsheets. Bugger that for a game of soldiers. Two of the grandchildren are coming to stay on Wednesday, so I won’t have a chance to play with the new pc until Friday, but that’s ok. Can’t wait to see them. Haven’t seen them for six months now. Love them to bits.